Three pools, two hot tubs and absolutely no agenda. Spread out all 1,000 pieces and see who can get their corner done first. Mini golf takes more than aim and timing. With a setting like this, it's almost impossible to keep your eye on the ball. The pool slide never gets old. Located steps from the beach. The children's pool and children's club keeps the kids happy. Your family will love swimming in the pool or zooming down the waterslides! Chill-out with a drink at the poolside bar. Designed by an award-winning architect, The Ridge at Playa Grande is an easy seven-minute walk to the famous Arch of Cabo San Lucas. Sip your welcome cocktail and admire the views from your elevated perch just above the shoreline. Get your day off to the right start with the resort’s free continental breakfast before getting changed into swimsuits and applying sunblock. Head for the heart of the resort, with three outdoor pools and a hot tub. Two adult infinity pools let you enjoy a relaxing swim while the kids take the waterslide route, landing with a splash into the children’s pool. Need something? Just ask your personal pool concierge. Enjoy a cocktail at the poolside tiki bar while the kids splash around. After the pool, challenge the kids to a family game of mini golf. Drop the kids off at the on-site children’s club while you hit the well-equipped fitness center for a workout or the tennis court for a game of doubles. Spa fan? Book early and often for signature treatments from the full-service spa’s rejuvenating menu. Your spacious, air-conditioned, upscale one- or two-bedroom condo sleeps four to six guests and gives you plenty of room to stash pool inflatables and shell collections, with separate bedrooms and living and dining areas. One-bedroom condos have kitchenettes, and two-bedroom condos have full kitchens. Whip up a batch of your famous chocolate chip cookies and let the kids assist with chocolate chip distribution. Feel like leaving dinner to the pros? Dine at one of the four on-site restaurants or ask about the private chef service. Cable TVs have premium cable, perfect for watching a sitcom rerun. Or head for the on-site sports bar and catch the big game. 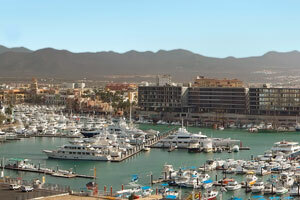 Visit the biggest mall in Cabo for a fun day of shopping at Puerto Paraiso. For apparel, there’s Pacific Blue, Forever 21, Kenneth Cole, or Tommy Bahama. Footwear can be found at Skechers, Soul Shoes, Innova Sports, or Flexi. Need a new swimsuit? You’re in luck! Tropica Boutique, Azul, Bari, and Beach House have several options. Get a new pair of shades at Sunglass Hut or Sunglass Island. Hungry? There’s Misaky Sushi, Burger King, or Ladiere Pizza. Cabo Adventures offers a variety of adventures that are fun for the whole family. Dolphin adventures include swimming with or riding a dolphin. There are even special dolphin experiences for little ones. Scuba dive at the Arch or Land’s End, go snorkeling or enjoy a luxury sunset sail. Go on an outback or camel safari. Dine under the stars. Private tours include luxury and sunset sails, whale watching, and dolphin swims. - Airport shuttle service is available on request. Contact the property in advance to make arrangements. There is no end to the fun when you visit Marina. Enjoy whale watching, golfing and snorkeling. Make sure to stop by Puerto Paraiso, the biggest mall in Cabo. In addition to great shopping, it also has a movie theater, an arcade and even a bowling alley!